If you read my blog (and it’s predecessor cheesy mash) then you will know my love of happy accidents. After all, my daughter is one of them. There is nothing I love more than experimenting in the kitchen, and having the luxury (less and less nowadays – perhaps that’s why I consider it to be such a luxury) to also put some thought into what I’m doing. Grabbing the things that I need to use up from the fridge, yes, but combining them in an unusual way, to make something rather special. A blend of inspiration and improvisation – what a happy dance. This is how my fermented chard salad came about too. 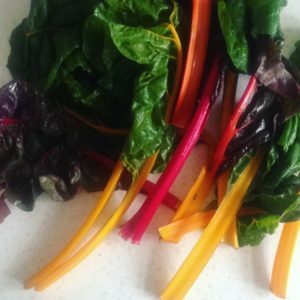 There is a summer bounty crop of rainbow chard at the moment and it’s half price at Farmdrop for I have been doing various things with it and I have found that it stands up very well to the fermentation process. It comes out tangy and crunchy. 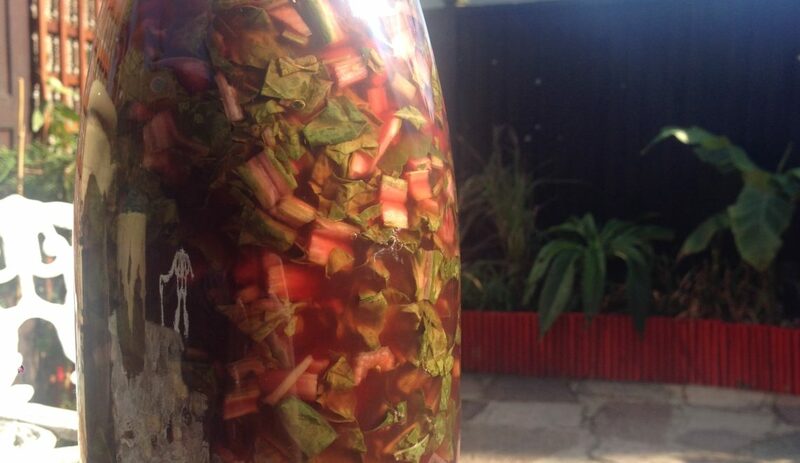 To ferment it is super simple. Chop it up, pound it with a pestle and mortar and cover with some warm water, which has a tablespoon of sea salt dissolved in it. Leave it for 3-5 days in a ceramic pot, then transfer to sterilised jar and keep in the fridge. I wanted to use it in a crunchy salad with other seasonal veggies and something else, something a bit different… I found inspiration in Nigel Slaters Kitchen Diaries Vol. III (I’m a little bit obsessed with Nigel Slater and his effortless, elegant style of cooking). In one of his salads he used puffed rice spiced with garam masala. Being Polish, I have plenty of puffed rice in the house. 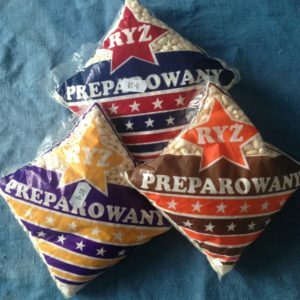 This puffed rice you can get from Polish shops is very solid and strong – ideal for cooking with. I used some milder spices with it, so bubba can enjoy the salad too. She loves puffed rice and fermented chard, so hopefully she will accept the other stuff too. She hasn’t got all her teeth yet, so crunchy vegetables can be a bit tiresome for her, but as this is one of those slaw-type salads that sits in it’s dressing quite happily, it will have softened by the time she eats it. 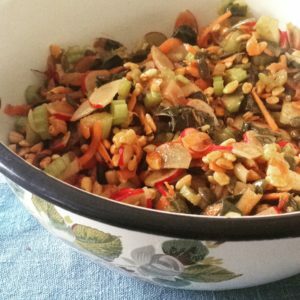 I rarely have the time to post these days, preferring the immediacy of Instagram, yet now and again I will share something that I think is worth talking about, and today it’s this spicy, crunchy salad. This recipe makes a large bowl. You can find more of my fermented chard recipes on farmdrop. Warm the tablespoon of oil in a frying pan and place the spices and the peanuts on it for a minute, stirring all the time. Take the pan off the heat and add the puffed rice. Make sure it’s all coated in the spices. Once cooled combine this with all the chopped vegetables and seeds. Pour the vinaigrette over the top. Mix well and allow to stand for at least 30min.